Daewoo Shipbuilding & Marine Engineering (DSME) announce a patent license contract with MAN Diesel & Turbo (MDT) for DSME high pressure-fueled gas supply(HP-FGS) system. Under this contract, MDT will use DSME HP-FGS system patents and licenses for its LNG propulsion based commercial vessel projects. Following the confidential agreement between two companies, specific license fee and other details of the contract have not been disclosed. 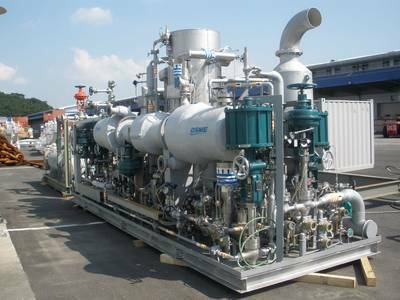 When the ME-GI engine was first introduced to the industry in the early 2000s, the high pressure gas compressor system was used as its FGS system, but since the compressor system consumes much power and occupies a large space, this engine was comparatively difficult to commercialise. However, the development of the high pressure pump-based FGS system by DSME helped to solve this problem and is now contributing to the building of several recent LNG-fueled ships with a radical improvement in power and space efficiency. DSME says they hold intellectual property rights on the technology. In May 2011, DSME completed HP-FGS system integration tests with the ME-GI engine at the MDT Copenhagen research center. In 2014, DSME will provide its FGS system to NASSCO for TOTE’s 3,100 TEU world first LNG-powered containership. TOTE's new containership will be constructed at NASSCO shipyard, and are now being designed by DSEC, a subsidiary of DSME. This design will include DSME’s patented HP-FGS system and a ME-GI dual fuel slow speed engine. Meanwhile, DSME add that they are discussing FGS license business with several related companies including engine makers to offer license for its FGS patents. “DSME will provide designing, engineering, commissioning and training services about FGS system to licensees” said Mr. Brandon Jung, who is CTO & senior executive vice president of DSME.